West College Scotland was aiming to simplify the photo capturing part of the enrolment procedure. Issuing Student and Staff campus cards for a total of around 32.000 West College cardholders is very time consuming and the enrollment procedure was not efficient enough. Screencheck suggested CardsOnline as a solution. Next to all the benefits of working with a central online system for card production and card management, CardsOnline also offers the userfriendly and effective E-Photo request feature that perfectly fit the enrollment needs of West College. Having to deal with the long queues at the photo studio, the challenge for West College was finding a campus card system that would make the enrollment procedure, especially the photo capturing part, efficient and fast. Further, the data flow between their HR/Student system and the campus card system needed to be fully automated. The aim was finding a system, that not only makes card production less time consuming, but also is ready for future needs such as an upgrade to smart cards to integrate facility systems. West College finds CardsOnline to be the online campus card system that fits their card production and management needs. A special request was made by West College Scotland, to automatically sent a E-Photo request email to the student after the studentsrecord has been imported into CardsOnline, so no operator has to perform an action to initiate the e-photo request. ScreenCheck facilitated in this request by creating a special data agent in CardsOnline with the above function. By making use of data agents which import data from the student admin and human resources systems into the database of CardsOnline, the processing of cardholders data is fully automated. The system is now based on PVC campus cards with a Photo printed on. For the future it will be possible to upgrade to smart cards to integrate facility systems, CardsOnline prepared to facilitate this upgrade. CardsOnline helped West College Scotland automate the card production process. Especially making the photo capturing process faster. 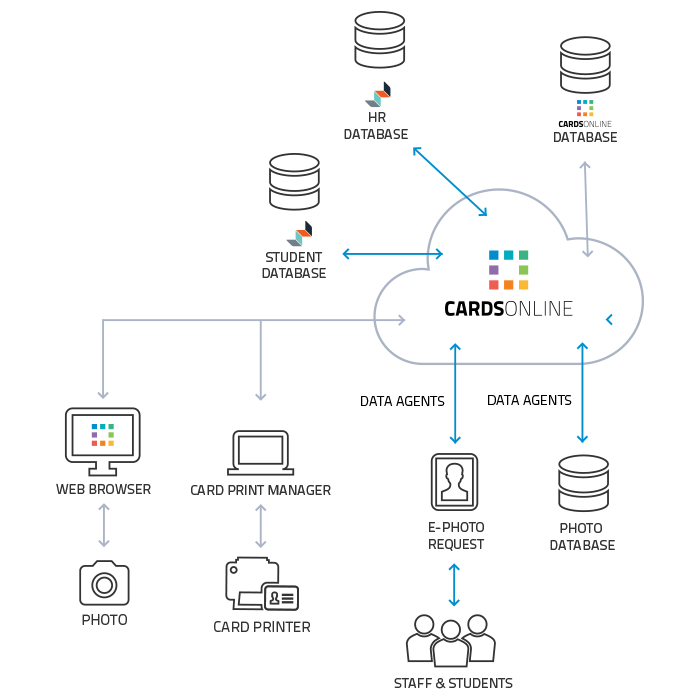 Using CardsOnline is efficient, clear, cost-cutting and creates the possibility to grow into a one card solution, intergrating new facility systems in the future.